Samsung Multi Blaster Tool is a small application for windows computer which comes with the very useful Samsung Tools for the Samsung Smartphone and tablets. It comes with the Samsung Z3Z V29.5, NCK Samsung, Hell Tool V3.0, Samsung Z3X V27.2, Samsung Z3X V28.2, Halabtech V0.2, Samsung Drivers, Secret GSM Fix Tool, FegaruKey V1.0, FegaruKey V2.9.4, FegaruKey V2.9.5, SamFix V1.3.0, SamFix V1.1 and Samsung Pattern Tool. It also comes with the FRP Hijacker Tool, Samsung ADB FRP Tool, D-G Unlocker Tool, GSD Android Tool, GSM Hunter FRP Tool, GSm Flasher, Samsung Service Tool, FRP Mini Box, Samsung Nougat FRP, Samsung Call FRP, Pattern Unlock V3.2, Samsung FRP Pro, Flyer SAM FRP Tool, Call Method FRP Tool, SAM FRP Helper, Zamsung Crypter Tool. 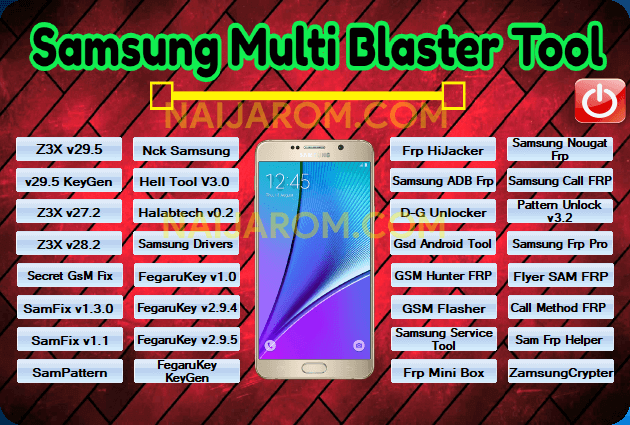 [*] Credits: Samsung Multi Blaster Tool is created and distributed by Gautam Great (developer). So, full credits goes to Gautam Great (developer) for sharing the tool for free.